Recent years have seen huge advancements in our understanding of the facial aging process. Whilst descent of the mid face and brow certainly plays a huge role, there is also a decrease in total facial soft tissue volume and accumulation of stubborn fat deposits in the lower third and jowls. 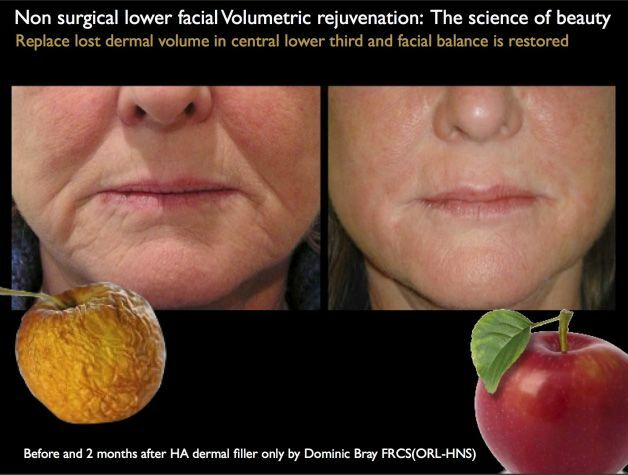 Some advocate solely replacing this volume to rejuvenate the face whilst others rely on facelifting alone. My approach is to do both, lift native volume back to where it should be and then add additional volume to the mid face, orbit and brow (with dermal filler or fat) and/or remove fat deposits from the jaw, chin and jowls if necessary. The initial consultation is an opportunity for you to talk and me to listen. I like to understand what has led to my patients seeking advice on improving their appearance. It is clear to me, contradictory to popular misconception, that the majority of patients seeking correction of signs of aging are motivated by far more than just vanity. There is no doubt that for most of us, when we look our best, we have renewed confidence and energy about every aspect of our lives. This new confidence is life enriching. I believe all people have a natural beauty about them and it is my job to bring that out. My philosophy is to enhance natural beauty, not alter looks, what I do is make people look as good as they can for their age, refreshed, rejuvenated and happy - they still look like themselves - just better! The most important factor in assessing suitability for facial contouring procedures is hands on examination of the problem areas. After a thorough examination, I like to use photography so that we can collectively discuss and plan what might be achievable. Often the camera picks up shadowing and light that the eyes might miss. The use of 3D morphing software is useful to simulate what surgery might achieve. I also like to confirm that my prospective facial contouring patients’ weight is stable as changes in general body habitus does affect facial fat volume. Taking fat from one part of the body and transferring it to another is not a new procedure, but until recently the results were not long-lasting or reliable. This is because the technique for transfer has been refined and the most e!ective anatomical donor sites have been identified. When we take fat from one area and transplant it to another, that fat needs to grow blood vessels to survive. By harvesting and preparing the fat in a specific way and transplanted it as microdroplets, fat survival is now predictable and reliable. Refinement of indications has also led to an improvement in longevity. Previously fat was used mainly in the lips and nasolabial folds (nose to mouth lines), we now know that the cheeks, orbits, temples and brow make the best donor sites. The only implants I advocate and use in the face are chin implants. For patients with a weak or recessed chin they are excellent for creating a balanced profile and/or elongating the neck chin angle. These are easy to place under local anaesthetic through a small incision in the crease under the chin. Cheek implants carry the risk of infection as they are placed through incisions inside the mouth, and to my eye do not give a natural result. In my opinion, the advent of deeper injectable dermal fillers has rendered their use unnecessary. The most common sites that accumulate fat in the face are the jowls, jawline and under the chin. No amount of dieting will remove these so surgical techniques have been developed to reduce their prominence. Fat can be removed manually, or assisted with powered suction, ultrasound and/or Laser. I use all modalities but prefer manual microliposuction in the face as it is exact and the suction pressure is softer and can be personally tailored. Fullness of the cheek and jowl can also be refined with removal of the buccal fat pad. This is a capsulated fat pad the size of a walnut that sits deep to the expression muscles of the face. A small incision is made under local anaesthetic in the mouth opposite the upper molars and the fat pad pops out. Dissolvable stitches are used for closure and the incision heals beautifully. This is a vital part of my surgical philosophy. When setting out my practice I wanted my patients to ENJOY their surgical experience. This is after all surgery they have chosen to have! I could have followed convention and operated out of leased theatres in large private hospitals but this didn’t fit with this philosophy. Overflowing car parks, receptionists I didn’t know, bank staff, theatre overruns and management dictat over patient experience. 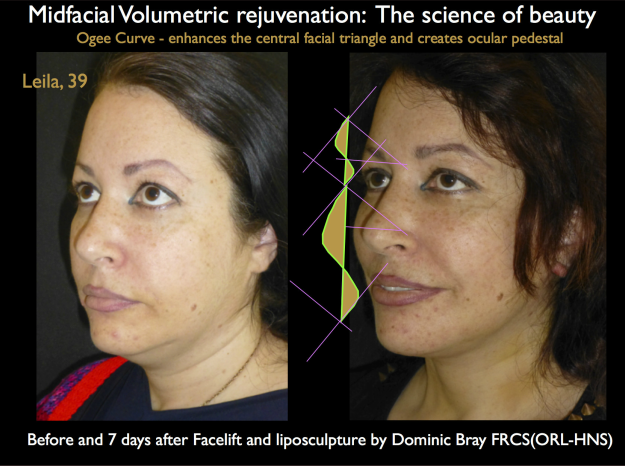 I travelled throughout Europe and the US to refine the model and my surgery is the result of this research. Custom built and registered facilities for facial cosmetic surgery, an environment that is a clinical home from home, sta! hand picked not only for their expertise but their approach and interpersonal skills, and surgery that is natural, contemporary, safe and individually planned and performed by me for each and every patient from initial consultation through surgery to final follow up visit. I am constantly refining the model to give my patients the very best experience. I believe that a patient that is relaxed, calm and comfortable, not starved for general anaesthetic, and who is familiar with the environment has lower blood pressure, lower circulating stress hormones and is in a far better place to start recovering from surgery. My assistant Lucy discusses preoperative preparation with all my patients, and everything is considered. From hair colouring to diet sheets, pre operative medications, supplements and specifics to avoid such as blood thinners - Non steroid anti-inflammatories (Ibuprofen, Neurofen, Volatarol), Aspirin and Vitamin E.
The surgical process begins at the initial consultation. I want my patients to truly understand all the options available and the risks before undergoing surgery. I take written consent for the procedure(s) we have mutually agreed and give a copy to take away and read at leisure. Any queries that might arise are welcome to be clarified at a second preoperative consultation. On the day of surgery patients are escorted to the surgical suite where they are given their own temperature controlled warming gown and thick comfy socks. After a relaxation tablet, I give numbing injections to selectively numb the planned areas of the face. Once in the theatre, and connected to a monitor, overseen by a consultant anaesthetist, an anti-inflammatory medicine and a small amount of sedation is given through a drip. After infiltration of a tumescent anaesthetic solution into the facial fat deposit, a very fine suction cannula is moved backwards and forwards in the fatty plane in two dimensions. This gently suctions the face out of the jowl, jawline or chin. A support garment then needs to be worn for 7 days to support the skin as it heals having reduced the fat volume. The results may not be evident for a few months as the overlying skin needs to heal and contract around the nearly contoured area. Fat is harvested from the tummy, hip or inner thigh in a similar method to liposuction above. The fat is then spun in a centrifuge to separate the fluid and blood to leave pure clean fat cells. These are then placed as microdroplets in the desired location(s) as very fine tunnels of fat graft. 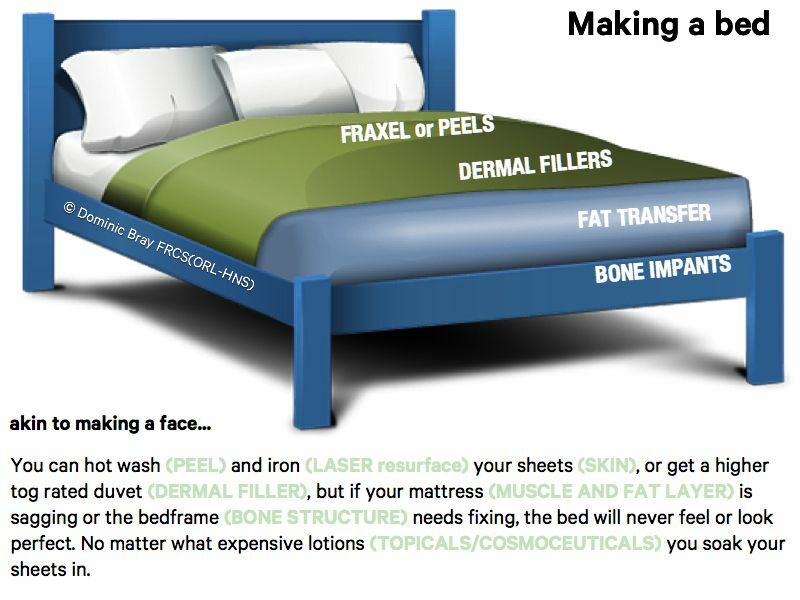 If they are placed in fine quantities on a muscle bed they develop their own blood supply volumising the area with your own cells. There is also transfer of stem cells which have been proven to improve skin quality and texture at the donor site. My patients literally walk out of the operating theatre into the recovery room and are back home (if local) or at the hotel within an hour accompanied by a family member or friend. It is quite normal for the face bandage to feel tight (the tissues are swollen with anaesthetic fluid) and sleeping propped up on a couple of pillows really helps. Bruising is inevitable as the suction and transfer process creates lots of tunnels under the skin which can cause bruising. This usually takes 14 days to fully subside. The amount of fat graft that survives is impossible accurately predict but most estimates are in the order of 50 60% so some over correction is necessary. Recent observational studies have also confirm that the results are progressive and improve for up to 2 years following surgery. Most patients can return to work when the swelling and bruising subsides which may be up to 2 weeks. (adipocyte derived stem cells), these have been shown to encourage new collagen and fibrin production which leads to further rejuvenates skin. To really get the best out of all facial cosmetic surgical procedures, I recommend ongoing skin care. Facial liposculpture and chin implant procedures are permanent.